Many of the keystream generators which are used in practice are LFSR-based in the sense that they produce the keystream according to a rule y = C(L(x)), where L(x) denotes an internal linear bitstream, produced by a small number of parallel linear feedback shift registers (LFSRs), and C denotes some nonlinear compression function. We present an nO(1)2(1−α)/(1+α)n time bounded attack, the FBDD-attack, against LFSR-based generators, which computes the secret initial state x ∈ 0, 1n from cn consecutive keystream bits, where α denotes the rate of information, which C reveals about the internal bitstream, and c denotes some small constant. The algorithm uses Free Binary Decision Diagrams (FBDDs), a data structure for minimizing and manipulating Boolean functions. The FBDD-attack yields better bounds on the effective key length for several keystream generators of practical use, so a 0.656n bound for the self-shrinking generator, a 0.6403n bound for the A5/1 generator, used in the GSM standard, a 0.6n bound for the E0 encryption standard in the one level mode, and a 0.8823n bound for the two-level E 0 generator used in the Bluetooth wireless LAN system. M. Briceno, I. Goldberg, D. Wagner. A pedagogical implementation of A5/1. http://www.scard.org, May 1999. M. Krause. BDD-based Cryptanalysis of Keystream Generators. 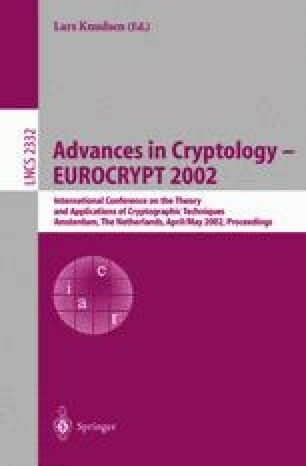 Report 2001/092 in the Cryptology ePrint Archive (http://eprint.iacr.org/curr/).